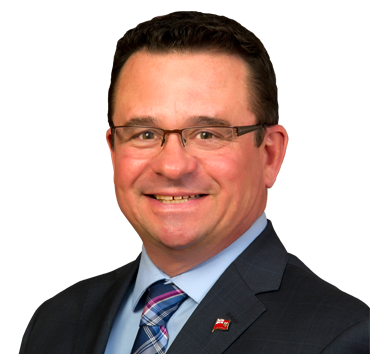 Jeff Wharton was elected to his first term as the MLA for Gimli on April 19, 2016. He is an entrepreneur, community leader, and long-time resident of Winnipeg Beach who is a strong voice for the Gimli constituency. After graduating high school, Jeff embarked on a career in the moving and transportation industry. In 1989, he and his wife Mickey purchased Globe Moving and Storage Ltd. The Wharton’s successfully grew the business for over 20 years before selling it in 2010. Jeff then opened his own consulting firm, using his entrepreneurial skills to help others nurture and grow their organizations. Jeff is an experienced municipal politician, having been elected as a Councillor for the Town of Winnipeg Beach. During Jeff’s term on Council, he served 2 years as Deputy Mayor. He is also a dedicated volunteer in the community. Jeff has served as President and Vice President of the Lakeside Lions Club, a Director on the Evergreen Basic Needs Board, and a Director on the Gimli Seniors Residence Board. Born and raised in Winnipeg, Jeff has called the Gimli/Winnipeg Beach area home for most of his adult life and is the fourth generation in his family with ties to Winnipeg Beach. Jeff and Mickey are the proud parents of daughters Melany and Jennifer and loving grandparents of three wonderful grandkids. Jeff is proud to be part of a new Progressive Conservative government that will respect taxpayer dollars, improve the delivery of front line services, and create new opportunities for the next generation of Manitobans.